In a previous post, I discussed the fact that Bob Malm’s almost $200,000 annual salary, plus his recent $100,000 bonus, means that he makes more than many Episcopal bishops. This article, reprinted under standard usage permissions from The Wartburg Watch, provides some additional context. Before diving into the article, it’s important to note that the Grace Episcopal church vestry doesn’t even see line-item detail on compensation. As a result, one parish employee, hardly overpaid, received unauthorized pay in excess of the amount approved by the vestry, and subsequently had to repay it. Or, put in other words, even most vestry members have no idea what Bob or other parish employees earn. That being the case, how do they know that mistakes have not been made? That there is no misfeasance going on? That they are exercising their legal obligations to the church by acting as fiduciaries? That begs the question: Why are parishioners giving sacrificially when there is zero accountability? With that, on to the article. Should Members Keep Giving Money to a Church That Refuses to Disclose the Pastor’s Salary? Today I became involved in a discussion on Twitater that raised a question. Should members of a church know the salary and benefits of their pastor(s)? 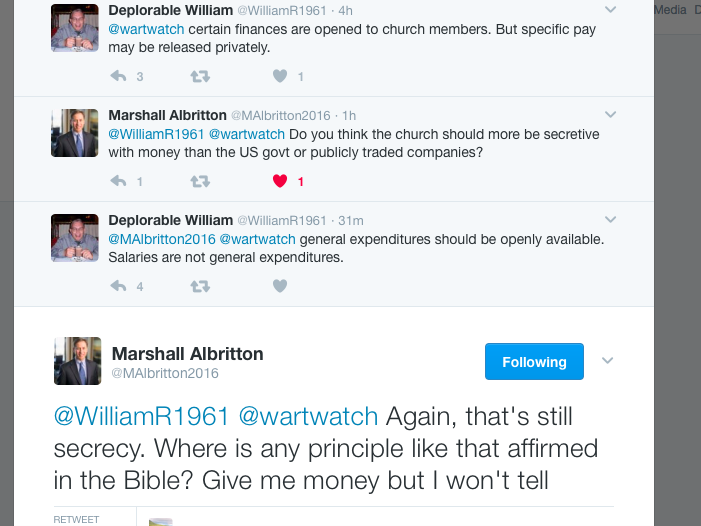 Except for *Deplorable William,* most folks seemed to believe that the membership should know the salary and benefit package of the pastor. This raised another question. Why do many churches not make it easy for to learn the pastors' salaries? In one of my former churches, one member asked to see the salaries of the pastors. The administrative assistant seemed annoyed and called an elder. The elder met with the member and asked "Why?" The member answered that he was giving money to the church and wanted to see how it was being used. Reluctantly, the elder led the member into a locked room. The member was force to leave his phone and all writing utensils outside the room. With a stern expression, the elder presented the member with the documents and sat there until the member was done. Once again, why? What are they afraid of? 2. An email from a reader about an interview with a candidate for a worship pastor position. A growing Baptist church in the Midwest was looking for a person with experience in leading worship. One young applicant (mid 20s) had some experience with a large church in Texas. The description of the church sounded similar to Ed Young JR's Fellowship Church. The young man, exhibiting a rather arrogant, "I know it all" attitude, then said he would not consider the position for anything less than in the low $100,000 range before benefits! He was politely escorted out the door. 3. A comment on Reddit about a pastor's large salary. Throwaway account here. I recently started to try and live a Christian life once more after being agnostic for the last few years. I've been going to a mid-sized Presbyterian church in a decent part of town(somewhat close to me) and I've been tithing regularly, really trying to be part of the community and support the church and their services and charity work. I just found out the pastor makes over $360,000 per year and I'm really struggling with this. Me: "Hey, what are the upcoming service or charity opportunities?" Him: "Well….we don't really have someone that does that but you are welcome to set something up and I'll email the church members to gauge interest." Me: "Uh, well then where is my money going? I thought it was going to service?" Him: "Well we just voted to give the pastor a slight raise, bringing his salary to $360,000 but please keep that between us. There's not really room in the budget to bring on a full-time service organizer"
This threw me for a loop, he got defensive, and I got into an argument with my friend as he claimed that we needed to keep the salary high to attract and keep good pastors(one of our pastors recently left). The church is in a nice area and he also claimed that they decided to pastor needed to make enough so he can afford a house close to the church. Apparently the other administrators and higher ups in the church make over six figures as well according to him. Obviously I'm heartbroken at where my money is going, with my understanding that most of my donations would go to helping those less fortunate. The other members of the church are unaware of his salary and I was asked to keep the salary disclosure secret from everyone else. The other members seem to be unaware of how much the pastor makes and just assumes the church is handling the money as it sees fit. Has anyone else seen this and struggled with this? Is it right for a pastor to make so much money? I understand that this may be the "free market" at work but the members have no idea about the allocation of their tithes. What is your views on this? I'm just so disheartened I'm thinking that my foray back into Christianity was a mistake. I understand that pastors need to make a living but this seems…excessive, especially when we have such a weak service division. Sorry if this seems long-winded and scattered, just trying to get my thoughts out there. I'm not saying that pastors should live with vows of poverty but that is a hell of a salary! Why are churches not transparent with the salaries of pastors? Most charities are subject to some level of transparency, but not churches. That leaves it up to the members to demand transparency. If you meet resistance from the leadership, maybe you might consider that rather than a sheep who is being fed, you are one that is being shorn. L Ron Hubbard is reputed to have remarked to fellow author Theodore Sturgeon " Y'know, we're all wasting our time writing this hack science fiction, You wanta make real money, you gotta start a religion ". It would get even better. The thirty year war that his religion, Scientology, waged with the IRS ended in 1993 with Scientology organizations being recognized as churches. This lack of transparency encourages the wrong people to enter the ministry. The strongest voice I have noted for church financial transparency is that of Reverend Frank Benson Jones. In his book Stop The Prosperity Preachers he argues that lack of transparency is one of the things that draws the wrong type of people into ministry. He believes that if the profits were removed, only prophets would remain. Non-disclosure agreements in churches are red flags. 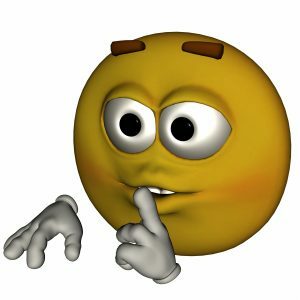 I have heard of some churches that require the members of the staff to sign non-disclosure agreements, and that is a sure sign the church is doing something wrong. Requiring churches and religious organizations to file an IRS form 990 would in no way impede the constitutionally guaranteed freedom of religion, but it would help to expose those greedy preachers who are using the constitution to conceal their improper accumulation of wealth at the expense of American citizens. Reverend Jones finds prosperity preachers forming something of a mutual admiration society to keep their con going. Any evangelist who preached to a congregation that the pastor should obey 2 Corinthians 8:20-21 by giving full financial disclosure to the congregation would not be invited back to that church and would probably be put on the undesirable list by other prosperity preachers who heard of the evangelist’s message. Any evangelist who is known for failing to support a pastor’s right to maintain the confidentiality of a church’s finances would be committing economic suicide and would eventually not be welcomed by the prosperity preachers who could afford to give such an evangelist the largest offerings. Why should we know the salaries of Congress but not our pastors? The large salaries of pastors and leaders of Christian non-profits are embarrassing. The Deseret News wrote Why Franklin Graham’s salary raises eyebrows among Christian nonprofits. Franklin Graham’s annual compensation of $880,000, revealed in a Charlotte Observer story, has some worrying that too many top Christian nonprofit leaders as well as pastors are seeing themselves as CEOs instead of as God’s servants. …CEOs at the top 50 U.S. charities, including Samaritan’s Purse, earn in the $350,000 to $450,000 range, which makes Graham’s $622,000 salary from his aid organization alone about 40 percent to 50 percent higher than average, according to a Forbes story. He receives the rest of his $258,000 compensation as CEO of the Billy Graham Evangelistic Association. A spokesman for Franklin Graham said his compensation was determined by independent commissions that compared similar organizations’ top salaries. Graham was not available to answer questions. …In a 2011 comparison of megachurch pastors’ salaries, two senior pastors made $1 million and $1.1 million. Others were a fourth to less than half of that. Among the exceptions: Southern Baptist the Rev. Ed Young, senior pastor at Fellowship Church in Grapevine, Texas, pulled in well over $1 million, according to a 2012 Dallas television news report. And in 2013, his last year as pastor at Seattle’s Mars Hill Church, the Rev. Mark Driscoll was drawing a $607,000 package, with a $150,000 raise promised. Taxpayers are subsidizing these salaries. Do you know what the federal nondistribution constraint is? Nonprofits are governed by the federal nondistribution constraint, which specifies that in return for tax-exempt status, they will use donations for the good of clients and not distribute excessive amounts to those who oversee the organization, Dixon said. “I don’t have a problem with people like Franklin making so much money as long as the janitor is making $60,000 to $80,000, a good living wage,” she said. How is it done in the UK? One of our readers sent me this comment a few minutes ago. I doubt Ed Young JR or Steven Furtick would set up shop in the UK? In the UK, virtually all churches are “charities”, giving the churches and also some of their donors tax benefits. As charities, the churches require to file annual accounts, which are accessible to the public online at the Government charities website. As I understand it, churches which are charities require to disclose in their accounts individuals who receive more than £60,000 per year from the church-this is disclosed by numbers of individuals rather than names or job titles, and it is disclosed against increasing increments of £10,000. If one assumes that the senior pastor is the highest earner in the church, then the senior pastor’s salary can be identified to the nearest £10,000 increment, provided the senior pastor is paid above £60,000. Some churches which are charities actually include their annual accounts on their church websites and/or identify those receiving £60,000 or more by name or job title. An experiment for you to carry out in your church. in 2010, Stuff Christian Culture Like posted Concealing the Pastor's Salary. Do not fall for the old "The pastor is accountable to a board of trustees " shtick. If a church has a tight reign on their spending disclosure, they often claim that their church financial records are accountable to a board of trustees. If you press further, you will likely find that said trustees live out of state and also pastor their own megachurches. What was that? My spidey sense is tingling! Or maybe it was just my imagination. No wait…now the lead pastor is getting into his Escalade and heading home to his gated community. Yeah. That was my spidey sense, all right. Do you want to see how this works? TWW posted Elevation Church: Bamboozled by Steven Furtick’s Ridiculous Compensation Committee? Here is an excerpt. Furtick, along with his buddy, the erstwhile "Chunks," refuse to tell you, their church contributors, including the leadership, how much money Furtick (and probably "Chunks" as well) is paid by Elevation. Furtick claims to be overseen by an "appointed" group of mega church pals to set his salary and benefits. I guess only those who labor daily in the fruitful vineyards are capable of understanding the intricacies of pastor wealth acquisition and how it is tied to the gospel. One would assume that Furtick would go to great lengths to have some folks on the committee who are not "raking it in." That does not seem to be the case. …So who are these guys? Until I was a member of Ed Young JR's church, I never questioned the salaries of pastors. I watched the lifestyle Ed and his wife were living and became suspicious. Of course, I couldn't find out his salary. I quit shortly thereafter. Another former pastor had lots of vacation time, spoke at lots of conferences, and always flew on the church's dime to *encourage* the missionaries all over the world. At that church I learned he was making $150,000/yr but he got other income from his outside conferences, book deals, and free trips all around the world. I wonder if writing books and going to conferences was on the church's time. I believe some pastors, including this one, double and triple dip. I quit that church as well. There is one well known pastor here in the Triangle who lives in a $600,000 home, gets toted around in private jets, speaks all over the place for good money and also published books. I do not go to his church but I know that members cannot access his salary. I believe that members who give money to a church have a right to know what the pastor makes. Why should I give money to people I do not know if they will not tell me how it is spent. A corollary: Why should I sign a membership covenant to be under the *authority* not someone I do not know. Some churches ask a lot of people. Be submissive to us, give money to us and do what we say or we will discipline you. On the other hand, there are churches in which the pastors lead humble, live in modest homes and drive second hand cars. In those circumstances, I do not bother to check their salaries although I could. If you are in a church in which you suspect the pastor is living large at your expense and you cannot find out his salary, get out of that church or stop giving. Give your money to nonprofits which must disclose the salaries of the leaders. Church members should say that they won't give until they know the salaries of the leaders.